For large fast ferry operators that need to reduce operating costs, Austal’s MARINELINK Smart vessel management system enables optimised asset performance that reduces fuel and maintenance costs and minimises downtime, unlike obsolete legacy monitoring and control systems. MARINELINK Smart is the latest evolution of AUSTAL’s proven MARINELINK monitoring system that has been in service for more than 20 years, fitted to more than 150 vessels in more than 50 countries worldwide since 1996. 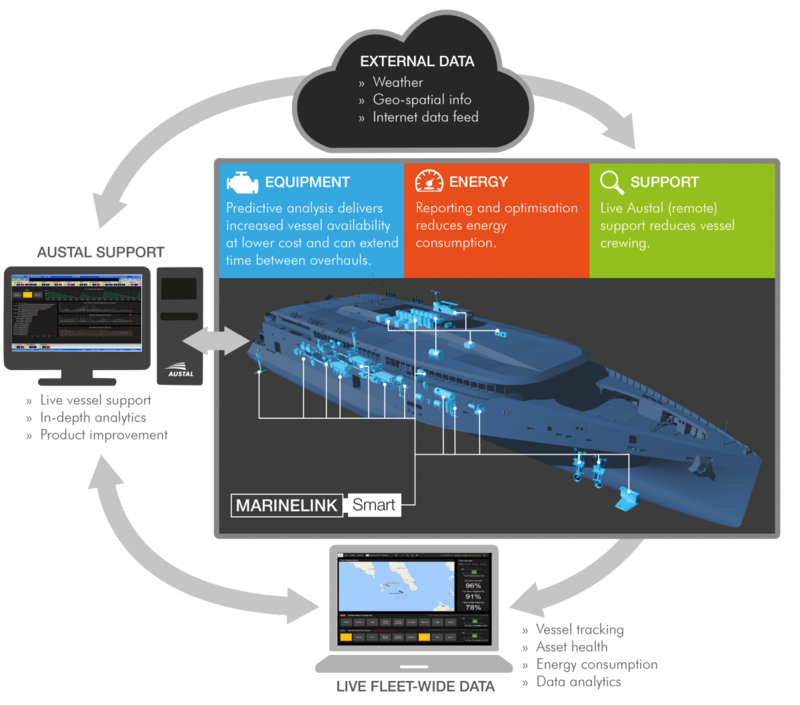 MARINELINK Smart optimises your asset by integrating a smart on-board, connected, sensor-rich, expandable software and hardware system with a continuous vessel support service. We use machine learning to advise operators on the optimum asset configuration to cut through-life costs and maximise vessel availability. Continuous fully integrated data monitoring at sea and ashore. Austal Support provides responsive 24 hour coverage for your asset. Constantly learning machine intelligence that provides the operator with analysis, insight and assurance in real time. The system effectively learns how the vessel operates with every journey and identifies strengths, weaknesses, opportunities and threats to optimum performance. Up to two million data points, collecting information from multiple vessel systems including power and propulsion, steering and hydraulics, electrical and HVAC located throughout the vessel. Customised dashboards for operation and maintenance on multiple screens throughout the vessel and remotely on shore based PCs. Industry standard data exchange protocols enabling easy integration with commercial and military off-the-shelf sensors and other components. Improved asset performance and greater efficiency as a result of informed decision making returns lower fuel, maintenance and crew operating costs. Continuous understanding of asset health prevents unnecessary inspections and/or invasive testing. Improved vessel availability achieved by using predictive analysis and machine learning to predict unscheduled critical equipment. Extended time between vessel maintenance periods supported by comprehensive historical performance data. Improved vessel energy management via the application of accurate information on usage. Open architecture allows ‘future proofing’ of the system and software updates eliminate the need for expensive upgrades. For further information download the MARINELINK Smart brochure, send us an email at sales@austal.com or telephone +61 8 9410 1111 and ask to speak to a sales representative.